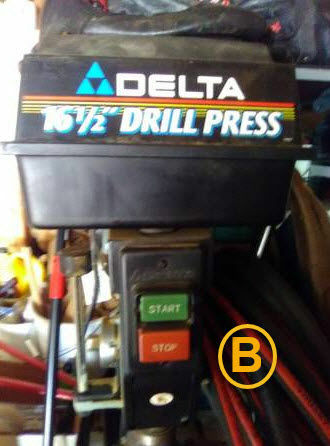 Two Delta floor model drill presses showed up on CL today. Both are listed as model 17-965. Some Googling didn’t help me try to figure out which is the later model. Anyone know? The one that looks like new (A) is listed for $400 and the other (B) is $350. Seems like A is the no-brainer choice, but I’m assuming that if B is the later model, it’ll have more features. Anyone know which is the later model? Also, what do you think of the prices? I would assume that the d.p. in picture A is the newest model, in my opinion. Picture B is exactly the model I have, and it’s close to 18-19 years old. You can tell by the color on the cowling in A and the body….all grey….!! There should be no difference in the # of pulleys, belt (s), quill length, chuck size, etc. It’s just a newer version of the other B…..The price is about right, but “haggling” the price may change that, depending how bad he wants to sell it. It’s just a matter of choice on your part. Like I posted on your other thread, I paid about $300-315 for mine at the time, and that was years ago….. 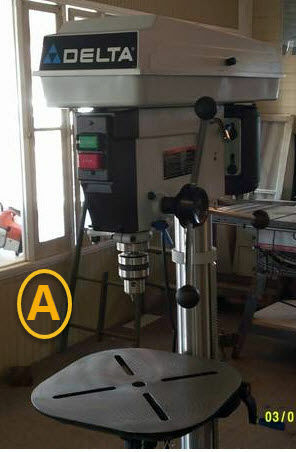 I have a late model band saw that is light grey like the first drill press in your pictures. I’m thinking the light grey one is later than the black one with the blue delta emblem. Might still see what others say though. Grab A before it’s gone. Grab A before it s gone. Not sure that it is necessarily any better to get the newer model. Some of the older tools were better made. If the older one is free of rust, it may be the better choice, or at least not any worse. Not saying it is true here but just because it is newer doesn’t mean it is any better. Just sayin’. Sorry you missed it. Good tools go FAST!!!! How was the other one? Did you get it? My rule is buy first, ask the wife for forgiveness later,! Sorry you missed it. Good tools go FAST!!!! How was the other do? Did you get it? The other one wasn’t bad, but I didn’t think $350 was a good price. Tried to haggle, but the guy wasn’t interested. I see it’s still on CL so I’ll just wait and try him again in a week or so if it’s still available. Not sure that it is necessarily any better to get the newer model. Some of the older tools were better made. If the older one is free of rust, it may be the better choice, or at least not any worse. Not saying it is true here but just because it is newer doesn t mean it is any better. Just sayin . That’s very true. Things aren’t built as well anymore (unless you want to pay BIG $), but newer tools also have some cool features. I’m a sucker for that stuff even though the logical part of my brain says “do you REALLY need that?” Or wait, maybe that’s my wife that says that? Hmm. My rule is buy first, ask the wife for forgiveness later,! Haha. I subscribe to that too.